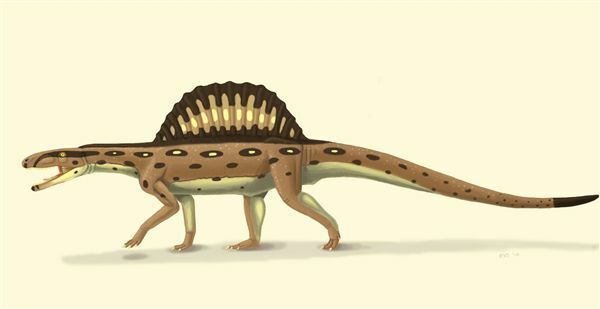 Originally classified as a proterosuchid -- and thus a close relative of the contemporary Proterosuchus -- a recent analysis has located Xilousuchus much closer to the root of the archosaur family tree (the archosaurs were the family of early Triassic reptiles that gave rise to dinosaurs, pterosaurs, and crocodiles). The significance of Xilousuchus is that it dates to the very beginning of the Triassic period, about 250 million years ago, and it seems to have been one of the earliest crocodilian archosaurs--a hint that these "ruling lizards" split off into prehistoric crocodiles and the ancestors of the first dinosaurs (and thus of the first birds) much earlier than had previously been thought. By the way, the Asian Xilousuchus was closely related to another sailed archosaur of North America, Arizonasaurus. Why did the cat-sized Xilousuchus have a sail on its back? The most likely explanation is sexual selection -- perhaps Xilousuchus males with bigger sails were more attractive to females during mating season -- or perhaps the sail fooled predators into thinking that Xilousuchus was bigger than it was, thus sparing it from being eaten. Given its small size, though, it's very unlikely that the sail of Xilousuchus served any temperate-regulation function; that's a more likely hypothesis for 500-pound reptiles like Dimetrodon, which needed to heat up quickly during the day and dissipate excess heat at night. Whatever the case, the lack of any sailed crocodiles in the later fossil record hints that this structure wasn't crucial for the survival of this widespread family.